Ellen White (1827-1915): “So Christ, at the close of His work as mediator, will appear, “without sin unto salvation,” … As the priest, in removing the sins from the sanctuary, confessed them upon the head of the scapegoat, so Christ will place all these sins upon Satan, the originator of sin. The scapegoat, bearing the sins of Israel, was sent away “unto a land not inhabited,” so Satan, bearing the guilt of all the sins which he has caused God’s people to commit, will be for a thousand years confined to the earth, …” (Maranatha, p. 252, 1976). Ellen White: “It was seen, also, that while the sin offering pointed to Christ as a sacrifice, and the priest represented as a mediator, the scapegoat typified Satan, the author of sin, upon whom the sins of the truly penitent will finally be placed. When the high priest, by virtue of the blood of the sin offering removed the sins from the sanctuary, he placed them upon the scapegoat. When Christ by virtue of His own blood, removes the sins of His people from the heavenly sanctuary at the close of His ministration, He will place them upon Satan, who, in the execution of the judgment, must bear the final penalty” (GC, p. 422). O. R. L. Crosier’s (1820-1913) view on the cleansing of the heavenly sanctuary: Ellen wrote, “I believe the Sanctuary to be cleansed at the end of the 2300 days, is the New Jerusalem Temple, of which Christ is a minister. The Lord shew me in vision, more than one year ago, that Brother Crosier had the true light, on the cleansing of the Sanctuary, &c; and that it was his will, that Brother C. should write out the view which he gave us in the Day-Star Extra, February 7, 1846. I feel fully authorized by the Lord, to recommend that Extra, to every saint (A Word to the Little Flock, Ellen White, 1847). O. R. L. Crosier (1820-1913): “…at the appearing of Christ, Satan is to be bound and cast into the bottomless pit (Revelation 20), which is symbolized by the scapegoat’s being sent into the wilderness;…so the oldest Christian view says that the scapegoat is a type of Satan. Thus, says Crosier, will the “author of sins have received them back again,” (L. E. Froom, The prophetic Faith of Our Fathers, Vol. 4, p. 1234, 1954). O.R. L. Crosier (1820-1913): “Thus we have the Scripture, the definition of the name in two ancient languages both spoken at the same time, and oldest opinion of the Christians in favour of regarding the scape-goat as a type of Satan. In the common use of the term, men always associate it with something mean, calling the greatest villains and refugees from justice scape-goats. Ignorance of the law and its meaning is the only possible origin that can be assigned for the opinion that the scape-goat was a type of Christ” (The Day – Star Extra, Saturday, February 7, p. 35, 1846). Note: Adventists teach that Satan will suffer punishment for the confessed sins of the redeemed but this is not Biblical. Our God Is a God of justice who will not violate His law which says: “Fathers shall not be put to death for the children, nor the children be put to death for the fathers; but every man shall be put to death for his own sin” (Deuteronomy 24:16); “The soul that sinneth, it shall die. The son shall not bear the iniquity of the father, neither shall the father bear the iniquity of the son… the wickedness of the wicked shall be upon him” (Ezekiel 18:20). Therefore, Satan’s own sin and his part in causing others to sin will be upon him and not the sins of the redeemed, for they are borne by Christ and He took their punishment. Satan’s punishment had been decided at his fall as we read in Matthew 25: 41 — “everlasting fire, prepared for the devil and his angels.” This would meet its fulfillment after the millennium: “And the devil that deceived them was cast into the lake of fire and brimstone…” (Revelation 20: 10). We do not find Christ transferring the sins of the redeemed from the heavenly sanctuary upon Satan’s head taught in the Bible. Although Satan is responsible for most temptations, we sin, not because Satan tempted us, but because we choose to sin, like Adam. David Dawson: “With Origen (third century) the scapegoat reverts unambiguously its demoniac identity. “The goat which in the book of Leviticus is sent away (into the wilderness),” Origen says, and which in the Hebrew language is named Azazel was none other than this [the Devil],” he is the wicked one…having fallen from heaven….The cause of man’s expulsion from the divine paradise”… This is why “it was necessary to send it away into the desert and to treat it as an expiatory sacrifice because on it the lot fell.” For all who belong to the “worse part, on account of their wickedness, being opposed to those who are God’s heritage, are destroyed by God”….When he writes of the day of atonement [that] remains for us until the sun sets; until the world comes to an end, and on which Christ “goes to the father to make atonement for the human race” and so propitiates the Father for humans,” interceding ‘not indeed for those who belong to “the lot of that he-goat which is sent into the wilderness’” but only who “are the lot of the Lord” (Ibid., p. 24). David Dawson: David cites Thomas Aquinas (1224-1274): “That the immolated goat “is slain, as a lamb, for the sins of those who are forgiven,” for the Lords portion is always slain” While the goat “loosed and sent out into the wilderness of hell with the sins of the people” is “the devil’s part…”” (Ibid., p. 27). John Milton (1608-1674): “That proud honour claimed Azazel as his right, a cherub tall…” (Paradise Lost, book I, 514- 547). Book of Enoch (200 BC): “And again the Lord said to Raphael: Bind Azazel hand and foot, and cast him into darkness: and make an opening in the desert, which is in Dudael, and cast him therein…. And on the day of the great judgment he shall be cast into fire” (Chapter 10: 4, 6). “And the whole earth has been corrupted by the works that were taught by Azazel: to him ascribe all sin” (Chapter 10: 8). Revised Standard Version (1952): “… but the goat on which the lot fell for Azazel shall be presented alive before the Lord to make an atonement over it, that it may be sent into the wilderness to Azazel” (Leviticus 16:10). Angel Manuel Rodrigues: “The goat is not bearing the sin of the people vicariously, but simply carrying it to the wilderness; returning it to Azazel, the originator of sin and uncleanness … it does not point to Christ as the one bore our sin as our substitute” (Director, Biblical Research Institute, General Conference of The Adventists, Aug 10, 1998). John Henry Kurtz (1809-1890): “…the act of laying the sins upon the head of the goat had regard to the sins already expiated and that they were sent into the desert to Azazel not as still unexpiated and deserving wrath and punishment of God, but as expiated, covered, and deprived of all their power” (Sacrificial Worship Of The Old testament, p. 411, 1863). Ellen White (1827-1915): “Some apply the solemn type, the scape goat, to Satan. This is not correct. He cannot bear his own sins. At the choosing of Barabbas, Pilate washed his hands. He cannot be represented as the scape goat…Christ was the scape goat, which the type represents. He alone can be represented by the goat borne into the wilderness. He alone, over whom death had no power, was able to bear our sins” (The Scapegoat in the Writings of Ellen G. White, Alberto R. Timm, Ellen White Estate, [taken from the internet on Oct 26, 2013]; Manuscript 112, 1897). Note: This is the only quote wherein Ellen White distinctly identified the scapegoat as Christ. Perhaps, God has preserved this statement as a proof of what Ellen White actually believed. If the Church would accept this statement to be a true revelation from God, then the whole doctrine of the sanctuary crumbles to the ground! For this reason they ignore this statement. Ellen White’s earliest statement on the scapegoat (made 39 years earlier) contradicts her 1897 statement “that Satan cannot bear his own sins.” See the following: “Satan not only bore the weight and punishment of his sins, but the sins of all the redeemed host had been placed upon him…” (1SG, p. 217, 1858; EW, pp. 294, 295, 1882). Note: In 1846 Ellen White “endorsed” Crozier’s view that Azazel represented Satan, and the ‘cleansing of the heavenly sanctuary’ to mean the removal of accumulated, confessed sins, by placing them on the head of Satan. Strangely enough, she changed her view in 1897, 51 years after attesting Crozier’s view. The sad truth about Crosier was that he being the architect of the sanctuary doctrine, repudiated both the Sabbath and the sanctuary teaching and left the movement in 1847. Albert Barnes (1798-1870): “By this expressive outward sign the sins were sent to the author of sin himself, ‘the entirely separated one,’ who was banished from the realm of grace. The goat itself did not lose the sacred character with which it had been endued in being presented before Yahweh. It was as much as the slain goat, a figure of him who bore our griefs and carried away our sorrows, on whom the Lord laid the iniquity of us all” (Barnes’ Notes on the Bible, Leviticus 16:8, 1834). David Dawson: “Jesus is the immolated goat, ‘offered to God as an offering to atone for sins,’ Pilate is the prepared man, and Barabbas the scapegoat” (Flesh Becomes Word: A lexicography of the Scapegoat: Origen on the Day of Atonement goats, p. 24, 1992). David Dawson: “In a commentary attributed to Bede the Venerable (672-735 A.D) we read, “the scapegoat goes, as a type of Barabbas led away when the people cry out for Jesus’ crucifixion” (Ibid., p. 26). David Dawson: Cites Cyril of Alexandria (378-444): “the first of the goats or bucks was allotted to God, who is over all things, as a dedication and a sacrifice, while the other was sent into the desert…”- something he deems at once “simple minded and ridiculous.” For how indeed could “he who is the fashioner of all things… endure admitting the apostate Satan, as a consort…of his power and glory” (Ibid., p. 28). David Dawson: Cites Eranistes: “Eranistes replies; The passibility of humanity and the impassibility of the divinity could not have been prefigured at the same time by one goat,” says Orthodoxos, ‘for after its death, it would not have revealed the living nature.” Thus “two were taken ….in order to reveal the two natures”….” “So the goat which fled into the wilderness is a type of Christ taking away all our sins far from the sight of God,” says Edward Leigh” (Ibid., p. 31). Charles Spurgeon (1834-1892): “Our lord Jesus Christ has taken away our sins upon his head, just as the scapegoat, and is gone from us – that is all: the goat was not a type in its dying, or in regard to its subsequent fate. The first goat was a type of the atonement; the second is the type of the effect of the atonement” (Day of Atonement, 1856). Charles Spurgeon (1834-1892): “Then the people’s sins were all gone too. Now, what a fine type that is if you do not enquire any further! But if you will get meddling where God intended you to be in ignorance, you will get nothing by it. This scapegoat was not designed to show us the victim or the sacrifice, but simply what became of the sins. The sins of the people are confessed upon that head; the goat is going; the people lose sight of it; a fit man goes with it; the sins are going from them, and now the man has arrived at his destination; the man sees the goat in the distance skipping here and there overt the mountains, glad of its liberty; it is not quite gone; a little farther, and now it is lost to sight. The man returns, and says he can no longer see it; then the people clap their hands, for their sins are all gone too” (Ibid). John Wesley (1703-1791): “For the Lord,” – For the Lord’s use by way of sacrifice. Both this and the other goat typified Christ, this in his death and passion for us; that in his resurrection for our deliverance” (Comment on Lev 16:8). Geneva Study Bible: “In this goat [the scapegoat] is a true figure of Jesus Christ, who bears the sins of the people [Isaiah 53:9]” (Comment on Lev 16:21. ). John Gill (1697-1771): “Two kids of goats for a sin offering; one of which was killed, and the other let go alive, and both were one offering, typical of Christ in both his natures, divine and human, united in one person; and who was made sin, and became a sin offering for his people” (Leviticus 16:5). The Epistle of Barnabas(80-120 AD): But what shall they do with the other [goat] ? Let the other, he saith, be accursed. Now attend ye, how the type of Jesus is made manifest” (The Early Christian Writings, The Epistle of Barnabas, Chapter 7:7). 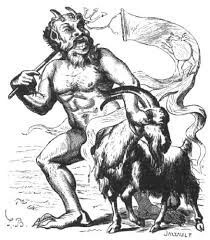 Alfred Edersheim (1825-1889): “The goat is led away into the wilderness—And pushed over a precipice—Meaning of the scape-goat –Reference to the coming of Christ, as He who would take away the sin – Meaning of the expression la—Azazel” (The Temple: its Ministry and Services as they were at the time of Christ, p. 20, 1880). Alfred Edersheim(1825-1889): “Assuredly a more marked type of Christ could not be conceived, as He was brought forth by Pilate and stood before the people, just as He was about be led forth, bearing the iniquity of the people” (Ibid., p. 312). Alfred Edersheim (1825-1889): “The word Azazel, which only occurs in Lev xvi., is by universal consent derived from a root which means “wholly to put aside,” or, “wholly to go away.” Whether, therefore, we render “la-Azazel” by “for him who is wholly put aside,” that is sin bearing Christ, or “for being wholly separated,” or, “put wholly aside or away,” the truth is still the same, as pointing through the temporary and provisional removal of sin by the goat “let go” in “the land not inhabited,” to the final, real, and complete removal of sin by the lord Jesus Christ, as we read it in Isaiah 53:6 “Jehovah hath made the infirmities of us all to meet on Him”” (Ibid., p. 324, 1880). Herz Homberg (1749-1841): “….the Lord having chosen him to be trespass offering like the scapegoat which bore all the iniquities of the house of Israel” (The Exposition of the entire Old Testament called Korem, 1818, Cited by Mark Eastman). Matthew Henry (1662-1714): “The slain goat was a type of Christ dying for our sins; the scape-goat a type of Christ rising again for our justification. The atonement is said to be completed by putting the sins of Israel upon the head of the goat, which was sent away into a wilderness, a land not inhabited; and the sending away of the goat represented the free and full remission of their sins. He shall bear upon him all their iniquities. Thus Christ, the Lamb of God, takes away the sin of the world, by taking it upon himself” (John 1: 29). (Matthew Henry’s Concise Commentary on the Whole Bible, 1706). John Trapp (1601-1669): “Two kids of goats—Both of them types of Christ: who though he died not for wicked goats, yet he seemed rejected of god, and was reckoned among malefactors [Isaiah 53:9]” (John Complete Commentary, 1654). William Kelly (1820-1906): “Both were requisite to give anything like an adequate figure of Christ’s atonement: — the one showing Christ towards God, glorifying Him up to and in death, and enabling God, so to speak, by the blood sprinkled upon and before the Mercy-seat, to act worthily of Himself; the other, presenting Christ as the substitute of those whose sins He bore, and bore away, so that they should never more be found” (Christian Annotator, 1854). J. W. Nevin (1803-1886): “In the type, at the same time, besides the sin – offering sacrifice, there was a scape – goat appointed, to bear away, symbolically, the sins of the nation; both these figures, however, were answered at once in the death of Jesus Christ. They presented only two different aspects of the general nature of atonement it accomplished; the one shadowing the transaction itself and its influence in heaven; while the other expressed, in significant emblem, its full efficacy to purge the conscience from all guilt, and to remove the transgression of all that make application for its benefit, so that they shall not be remembered in the way of judgment any more for ever” (A Summary of Biblical Antiquities: Compiled for the use of Sunday school Teachers, Vol. 2, p. 186, 1830). Note: It is abundantly clear from the Scriptures (Leviticus 16:5-10, 21) that the Scapegoat is Christ the sin bearer (Isaiah 53: 4, 6; John 1: 29). How else can we interpret the scapegoat which in every respect resembled the lord’s goat? Both the goats were presented by the congregation for a sin offering; both were unblemished (If the scapegoat were to represent Satan, why were they required to present an unblemished one — as any goat would do? ); both were presented before the lord in a solemn ritual (can you imagine Satan standing alongside Jesus attempting to make atonement for his own sinful subjects? ); one was slain as sacrifice and with live goat the atonement was made. How can Satan be represented by an unblemished goat (a symbol of the Lamb of God) consecrated for the service of God?